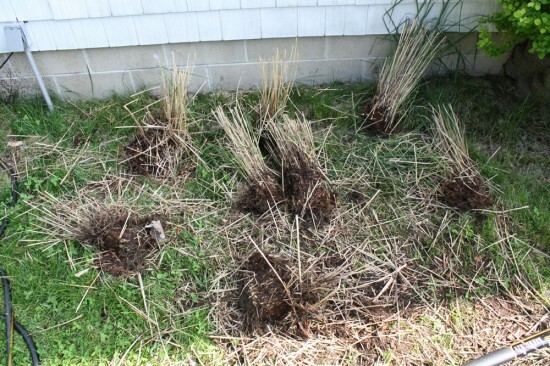 Step 43 of my preparation to move to another state was digging and dividing my ornamental grass today. But even if I weren’t moving it was past time to do this. 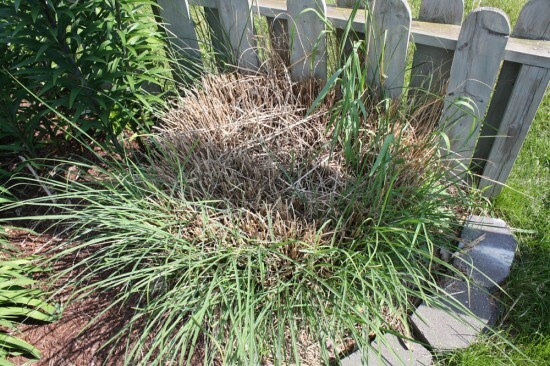 Miscanthus, the sort of grass I have (miscanthus sinesis ‘Morning Light’) also called maiden grass, grows from a rhizome and as it gets older it gets spreading out, with the older rhizome stopping to produce, and you get this sort of doughnut shape or bald spot. Irises, another rhizome plant, will do this same thing. Plant a single iris in a large area and eventually you get this circle with a barren area in the middle. 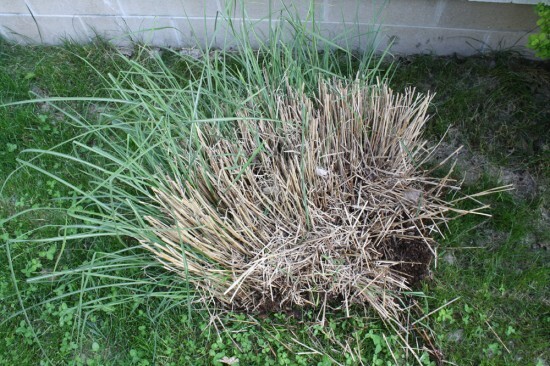 Miscanthus ornamental grass with a dead center, in need of division. This thing was wicked hard to dig and cut into. Miscanthus rhizomes are hard, basically wood, so it was like cutting into wood with my shovel. It did not go well. But eventually I got a big clump of it dug. The rest I left there, it’ll fill back in with time. So now I had this big clump and I had to cut it into smaller more manageable clumps. The shovel wasn’t happening, I got out my new axe. I would highly, highly recommend the axe. Also for the first top of getting that clump out of the ground. Of course, a full size sharp axe, be careful with that. Put the clump on the ground, stand back from it, and chop down, letting the axe head go into the soil. Never swing an axe in such a way that you could miss, or swing all the way through something, and hit your legs or feet. That would be bad. I chopped the clump up into 4 inch or so pieces to put into 6 inch pots. A few bigger chunks I tossed into bigger pots I had. Normally I would probably want all bigger pots, but this is the size I bought a whole case of for moving plants. I ended up getting about 8 divisions, discarding the inner barren parts of the clump. 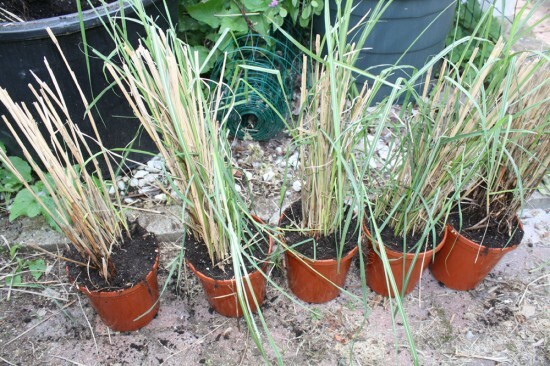 This is a pretty good haul, potted up and growing miscanthus like this will be at least $10, probably more like $25 at the garden center. So I just saved myself at least $80 on the plant cost of my future garden, and considering I’m going for a fraction of an acre to 20 acres, I will have a lot of plants to purchase. I saw something on a gardening show about using a reciprocating saw on grass clumps. In fact, they suggested cutting out the bald center of a large clump and making a hole which is filled with good soil so the grass would then grow inward. I have not done anything so my Miscanthus is splaying out more each year. Maybe next year. I know what you mean about free plants. I often chop them in half in the early spring and replant for a fuller garden with more repetition. Great guide. Thank you so much for sharing this. Because of guides like this from blogs, gardening is made easy. Thanks so much for tis info. I haven’t been able to figure out what was happening with my grasses. Now I have to find out how to divide my iris patch . I used a chainsaw 8 years ago. A dangerous project! Great tip about the axe going straight into the ground, sounds like a pretty safe option. I’ve never divided anything that big or woody so I just used a dollar store bread knife on the smaller stuff like hostas.